But first the restored 'Super Star' Constellation must be trucked – carefully – for 3 days to its new home outside of JFK airport in a massive hotel development. AUBURN — After sitting outside the Auburn-Lewiston Airport for 30 years, a rare Lockheed L-1649A “Super Star” Constellation with a new face-lift is headed to New York City to become a cocktail lounge outside John F. Kennedy International Airport. 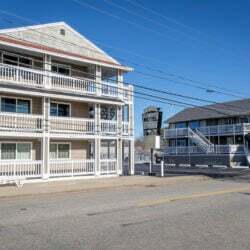 It’s part of a massive, new 512-room hotel development at the former TWA terminal. 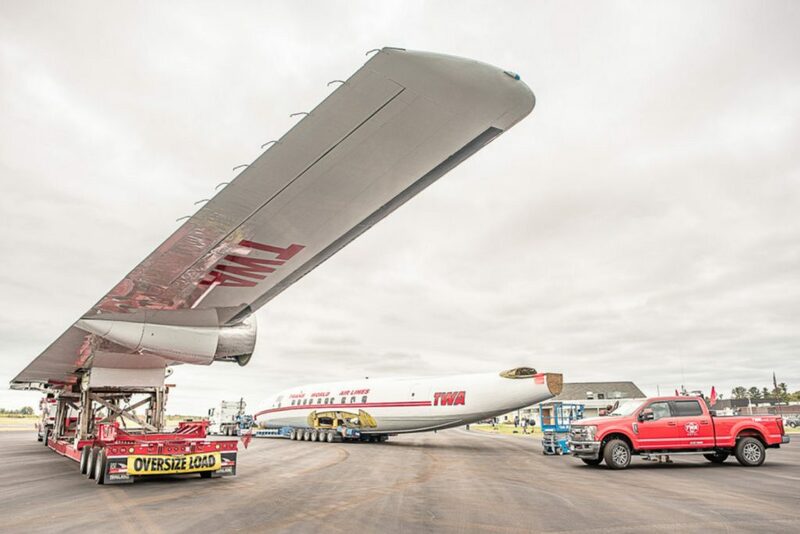 The wings, body and tail of the rare aircraft will travel as part of a six-truck, mile-long convoy to Queens to become part of the TWA hotel complex. 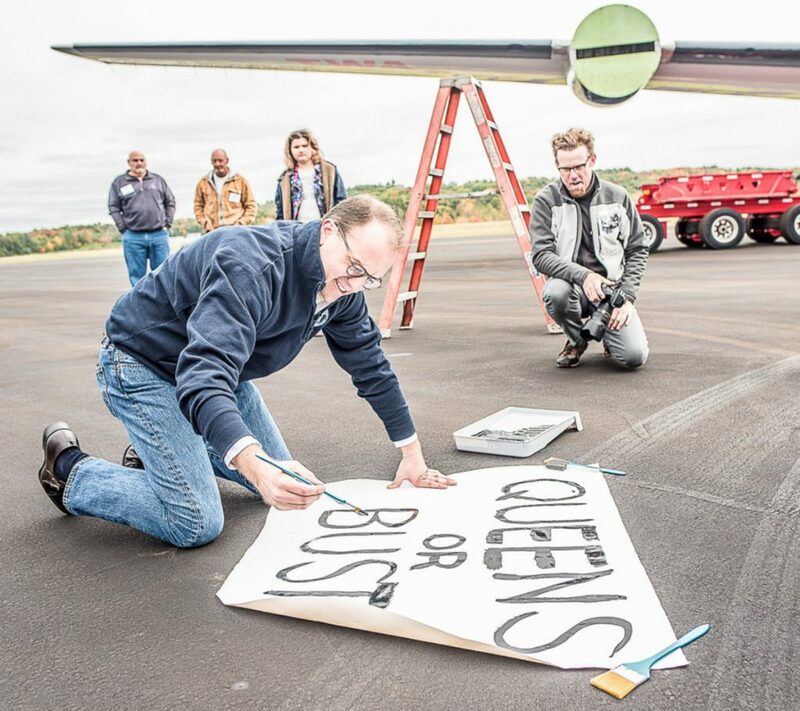 MCR CEO Tyler Morse paints a sign, reading "Queens or bust," before hanging it on the back of the 150-foot fuselage. Visitors to the plane-turned-cocktail lounge will "feel like you walked into 1962," he said. 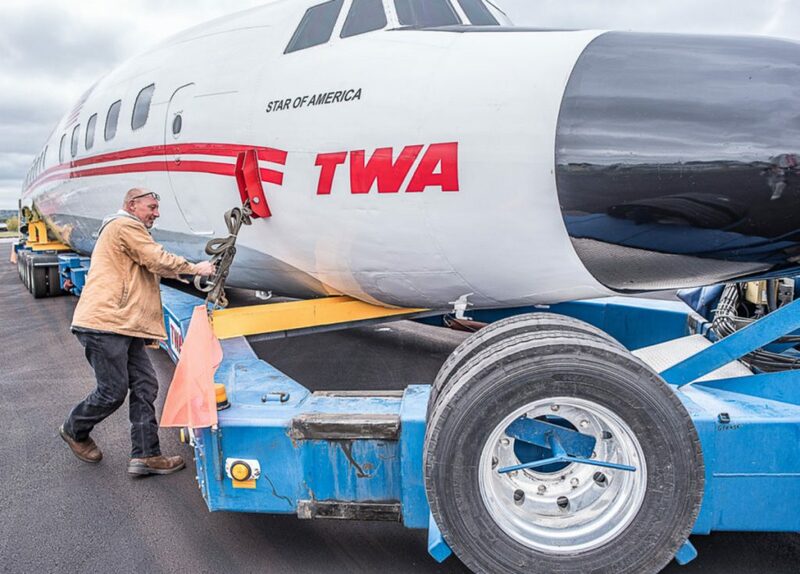 During a ceremonial send-off Monday, Tyler Morse, CEO of MCR and Morse Development, which are behind the TWA Hotel project, hand-painted a “Queens or bust!” sign and hung it on the back of the 150-foot fuselage as it sat on the back of a flatbed at the airport. “It’s amazing; she looks beautiful,” said Morse. 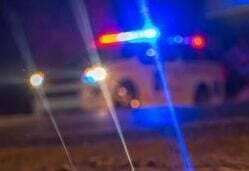 It will start the 328-mile journey to JFK at 7 a.m. Tuesday, part of a six-truck, mile-long convoy. The plane, built in 1958, is one of two Constellations once owned by Maurice Roundy and parked since the 1980s by the A-L airport. The other Constellation there is currently packed up and waiting to head back to Germany after a decade-long effort by Lufthansa Technik to try to return it to flying shape. The plane headed to JFK had been used as a parts example on that Lufthansa project. Morse said it was one of only four Lockheed L-1649As still in existence. He’d had his eye on it for five years for the hotel project, finally buying it from Lufthansa last year. The restoration started in May. Morse declined to reveal the cost, other than to say “it’s expensive” and part of the overall $265 million project budget. At its new home, the plane will be craned into place. As a lounge, it will seat 110 people and give visitors the chance to sit at the controls. Moving it will be no small feat: Someone had to virtually map every foot of the route looking at clearance around telephone poles, fire hydrants and bridges. 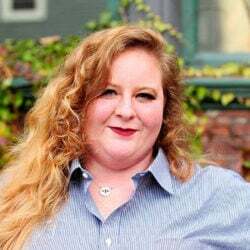 “This truck is so big and its load is so long that we actually have to let the air out of the tires to clear a few underpasses because we come within 2 inches,” Morse said. Marty Batura of Worldwide Aircraft Recovery out of Omaha, Nebraska, said it’s his fourth time transporting a Constellation but the first time moving a 1649A craft. 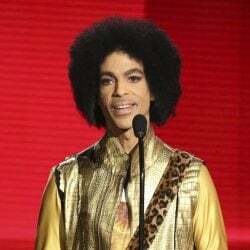 The trip is expected to take three days. “There’s going to be a lot of double-takes,” Batura said. Bettyann Sheats, who chairs the airport board, said she’d been excited when Lufthansa first bought both planes planning to restore one, but had worried about what would happen to the one that wouldn’t fly. Airport Manager Rick Lanman echoed the historic sentiment. Simon Graham, from Custom Canvas and Upholstery in Lewiston, was part of the monthslong restoration, rebuilding the cockpit from gutted metal insides, lining the walls and restoring four chairs – two for the pilot, one for the navigator and one for the engineer – in Italian leather, back to their original retro look. It took Graham and an assistant three weeks, often sewing on the back of a flatbed truck parked outside the plane. Tom Olke of Lewiston spent weeks stenciling on TWA logos, numbers and letters on the outside. Roundy, the plane’s original owner, was one of his flight instructors when Olke was learning to fly. The plane headed to the hotel and the Lufthansa-owned craft were two of only 44 Lockheed L-1649A “Super Star” Constellations built more than a half-century ago. The Lufthansa restoration started in 2008 and employed hundreds of people at times. The company announced in March that the project would stop here, before it was able to fly, and resume in Germany. It’s since had the wings removed and been crated up inside a hangar. Lanman said it’s ready to ship whenever a ship date and location have been determined. The new TWA Hotel and the plane-turned-lounge are expected to open in May 2019.